The market is segmented by Vehicle Type (Passenger Cars, Light Commercial Vehicles, Heavy Commercial Vehicles, and Alternative Fuel Vehicles), Application (Tire pressure Monitoring Systems, Brake Booster Systems, Engine Management Systems, Exhaust Gas Recirculation Systems, Air Bag Systems, Vehicle Dynamic Control, Power Train and Body Electronics), and Region. 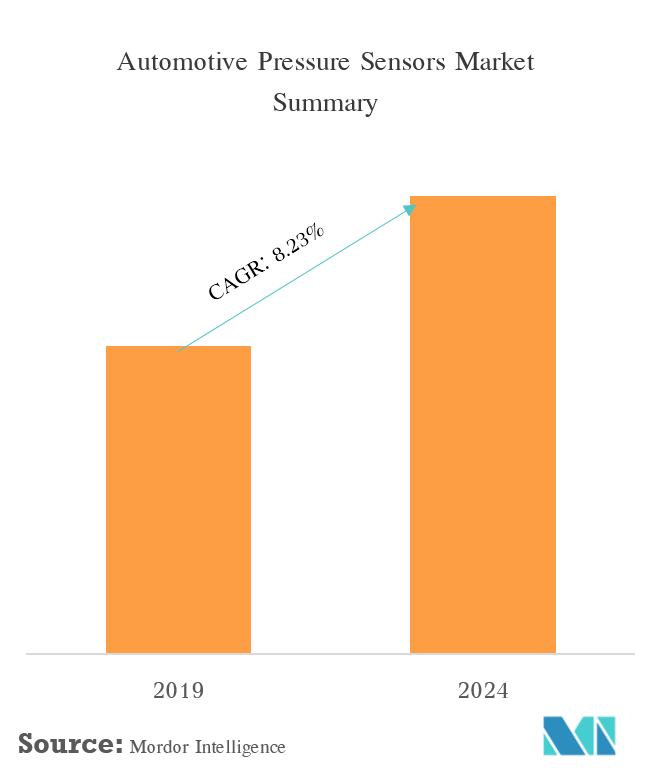 The global automotive pressure sensors market is valued at USD 4.3 billion in 2018, and is expected to reach a value of USD 6.91 billion by 2024, registering a CAGR of about 8.23% during the forecast period (2019-2024). As the automotive industry moves to adhere to the global environmental regulations in Europe, North America, Asia, and elsewhere, the industry is promoting efforts to boost the efficiency and achieve higher control accuracy of an engine system. Moreover, due to increase in pressure sensor applications, such as the use of a barometric pressure sensor to perform altitude correction when driving at high-altitude, pressure sensors are used in automotive to achieve high accuracy at a low price. Additionally, the automotive industry is the biggest and the oldest market for pressure sensors. Therefore, powertrain applications account for more than 50% of the pressure sensors business, followed by safety, with Tire Pressure Monitoring Systems (TPMS) being the most significant single automotive application. The rising environmental and safety concerns coupled with stringent government regulations for vehicle emmissions and safety norms, owing to the increasing number of vehicles are some factors driving the need for automotive pressure sensors in the market. Automotive pressure sensors market is growing steadily due to the increased stringent government regulations for carbon emissions and car accidents. The scope of the market is limited to three vehicle types - passenger vehicles, light commercial vehicles, heavy commercial vehicles. TPMS utilizes pressure monitoring sensors within each tire that monitors specific pressure levels and sends all the data to the centralized control module. 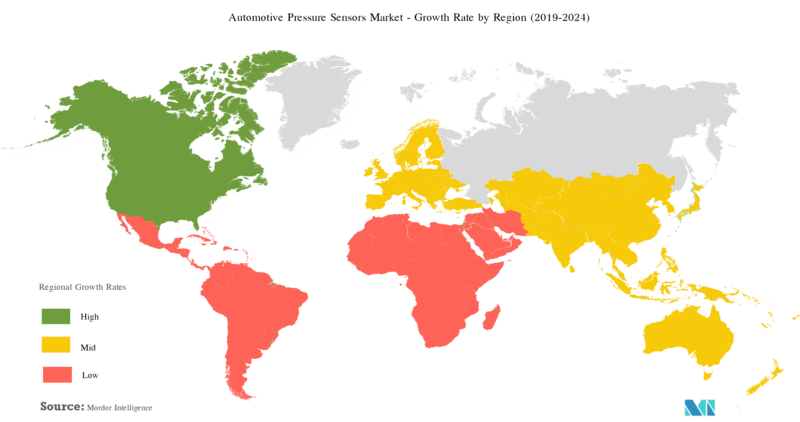 TPMS was mandated in the U.S. and EU in 2007 and 2014 respectively. The law came about as a result of over 100 deaths in the late 1990s that were attributed to vehicles running with underinflated tires. There are two types of TPMS, direct (dTPMS) and indirect (iTPMS). TPMS is getting smart with the advent of connected cars or autonomous vehicles technology. The technology is increasing the adoption of TPMS as it provides real-time data on vehicle tire pressure, and also offers critical information on tire temperature. High tire temperatures can indicate an excess of friction caused by misalignment of the wheels, which can also contribute to early tire wear and less safe driving. Hence safety awareness among individuals is another factor driving the increased adoption of TPMS. Also, several manufacturers are manufacturing TPMS based on Bluetooth Low Energy (BLE) communication standards. BLE helps in cutting down on development, qualification and logistical costs while allowing over-the-air firmware updates and other general maintenance that would otherwise not be possible. BLE ensures that TPMS sensors are constantly kept up-to-date, secured, and optimized. Recently Baolong and NXP rolled off 15 million sensors for tire pressure monitoring off the production line as a result of the close collaboration that started in 2004. 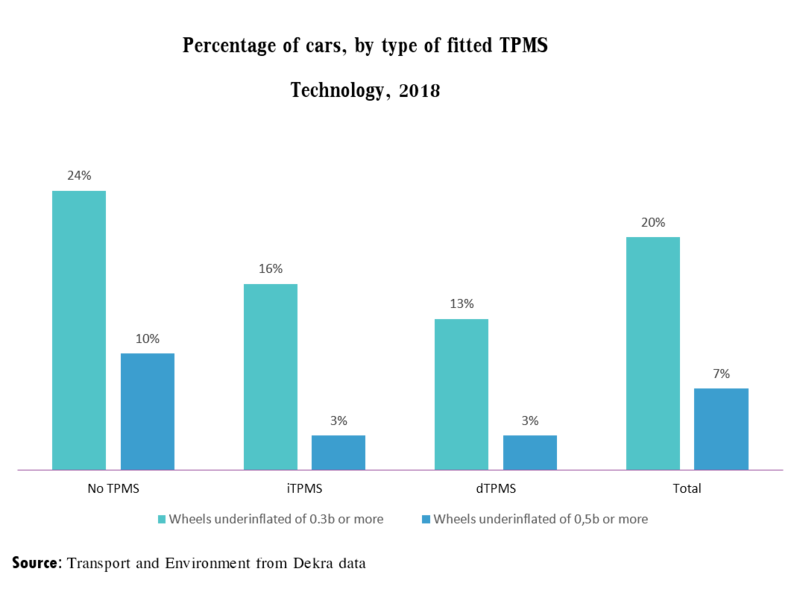 The Asia-Pacific region has been a home to the manufacturers that provide sensors with China, India, Japan, and Taiwan Being the major contributors. The growth in Asia-Pacific owes to the development of automotive industry in countries, like China and India. Also, the Asia-Pacific region has been the largest contributor to the automotive industry’s growth over the past few years. The growing economy and advancements in the regulatory framework in the region have also helped the passenger car sensors market boom in the region. The major trend driving the Asia-Pacific automotive sensor market is miniaturization and improved communication capabilities, which in-turn enable their integration into vehicles without interfering with the basic functionalities of the vehicle. Increasing automotive light vehicle production is also driving the pressure sensor market in Asia-Pacific. Other factors such as low cost, compact size, ecofriendly nature, and bulk manufacturing capability are the key factors that are helping the automotive sensors market grow. Recently, with the advent of connected cars and automated driverless vehicles the demand for technologically advanced sensors, which have better efficiency and reliability in terms of functioning, have increased substantially. Also, rise in government grants to improve industrial infrastructure along with the availability of cheap labor and raw materials has been few additional key factors that have substantially increased the production of automotive sensors. Increased R&D in the sensor industry is creating opportunities for technological advancements that open up new horizons for sensor applications. The global automotive pressure sensors market is consolidated with few major players holding the majority of the share in the market. 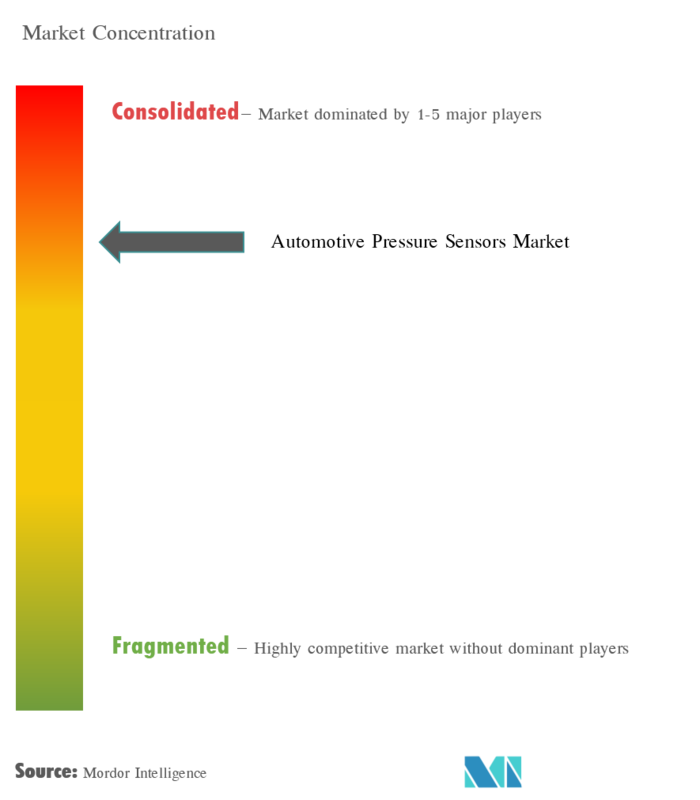 Although, it can be assumed that almost all pressure sensor manufacturers serve as automotive suppliers, the barrier to entry for prospective automotive suppliers is quite high. Organizations, like Robert Bosch has aggregated production volume of automotive, as well as consumer markets to reduce cost, and further increase its competitive advantage. 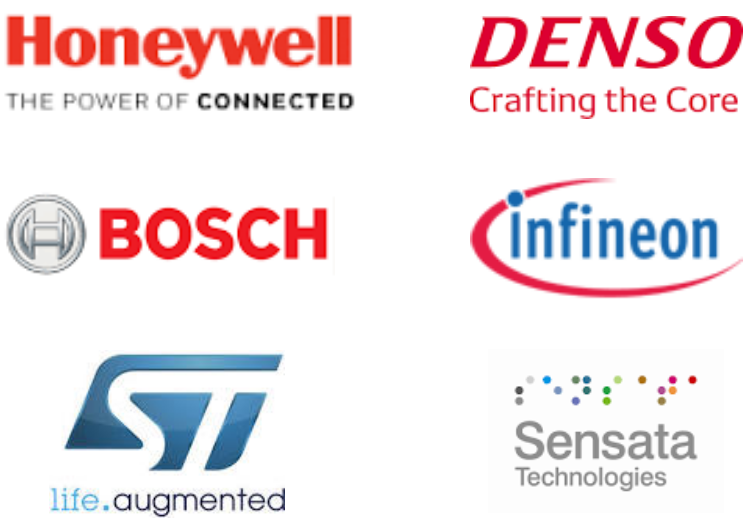 Other players, like Infineon, Sensata, Denso, and Melexis are mainly focused on the automotive sector, with vertical integration being a usual phenomenon in the sector. Robert Bosch GmbH introduced the SMP14x, a hydraulic pressure sensor for automatic transmissions that enables a high degree of driving comfort to the vehicle's passenger.